Heat the oil and the butter together in a small pan that is safe to use in the oven. Add the bacon and fry until golden and cooked. Add the spinach and chives and fry until wilted and liquid has cooked away. Beat the eggs and seasoning together until frothy. Pour into the pan. Cook over medium heat for about 2 minutes and make sure to pull the sides away to allow for the egg to run in underneath. 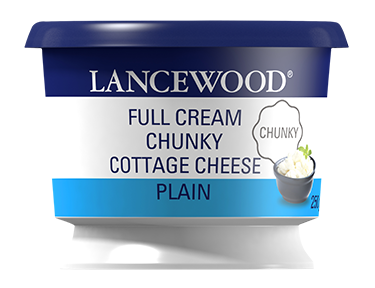 Spoon the LANCEWOOD® Full Cream Chunky Cottage Cheese on top and place under a heated grill for 2 minutes. The centre must still be slightly wobbly. Remove from the oven and serve with chopped parsley. Use ham or shredded cooked chicken instead of bacon.